CONS: A little noisy at times. 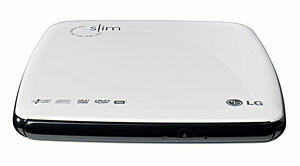 Slim'n'neat portable CD/DVD rewriter for travellers. It's all well and good strutting around town with your snazzy slim'n'light ultraportable laptop but if there's no optical recorder lurking inside you're going to feel a bit of a chump when you need to back up content or access material on CD or DVD. 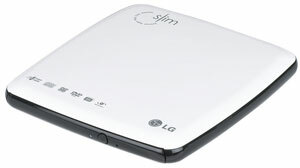 Thankfully, LG's external CD/DVD rewriter, the LG GSA-E50N Slim, could be just the fella for slipping in your laptop bag, offering a fully featured drive in a lightweight (just 400g) and slimline (16.5 x 15.5 x 2cm) offering. 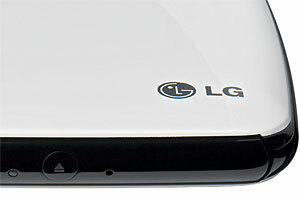 Fresh out of the box in its lively white and black glossy finish, the LG GSA-E50N package includes a USB 2.0 cable, a USB power cable and a software bundle including PowerDVD for movie playback, PowerProducer for basic video editing, NeroExpress for burning audio CDs and video DVD, and the 'In CD' packet writing software. Usefully, the E50N can also password protect discs using the SecurDisc option in Nero Express - although the files will still appear in Windows Explorer, they can't be opened without entering your password into the unlocking utility. The design of the GSA-E50N is pretty straightforward - there's a single button for opening the CD/DVD tray and a flashing LED to indicate disk access, while on the back there's just a standard mini USB and a power input for grabbing power from an additional USB port if needed. The player draws power from the laptop via a single USB 2.0 lead so you won't have to lug about (and inevitably forget) a separate power adapter. If your laptop only supports USB 1.1, the second USB lead can be added as a power source - a bit of a pain, but still better than having another power brick in your bag. When we plugged the LG into our Lenova X32 laptop, the Windows drivers were installed automatically and we were able to start rocking the house with a Gaz's Rockin' Blues CD within seconds. Double Layer DVD+R (8.5GB) and dual layer DVD-R (8.5GB, backed by a 2MB Cache Buffer with buffer Under-run protection. Writing speeds are claimed at 8x DVD + or -R; DVD+RW at 8x, DVD-RW, DVD+R DL and DVD-R DL at 6x; DVD-RAM write at 5x and CD-R and CD-RW write at 24x. We found that we got speeds a little below these figures but it was still much nippier than most other portable optical recorders we'd used. The CD/DVD player wasn't exactly silent in use (but we've certainly heard a lot louder) and we found it to be pretty reliable at handling all formats. As portable, slim CD/DVD rewriters go, the LG GSA-E50N represents great value at around �45-55 and could prove an essential addition to the portable traveller's mobile kitbag. The device is easy to set up, fast to use and comes with enough useful software to get you up and running in no time. In fact, we liked it so much we went out and bought one. Recommended.